The Wall It was just a year ago that authorities in Communist Germany threw up their Wall of Hate in Berlin. Today, demonstrators in Berlin march along a wall in protest against the barrier and hold memorial services for those who died trying to escape from East Germany. Freedom Bell in Berlin, is rung for the first anniversary of the installation of the Berlin Wall. Barricades, barbed wire. American Flag behind barbed wire. US army check point. US soldiers in army jeep with machine gun, pass camera as they monitor barrier. Mayor of Berlin? Memorial services. West Berlin demonstration. Nightfall brings a rock throwing barrage, police presence. News in Brief: The Berlin Wall Berlin, Germany "The wall dividing East and West Berlin marks its sixth anniversary as tourists constantly flock to see it. Escape attempts have dwindled and armed East German guards maintain their patrol." LS Brandenburg Gate. MS Tourists walking in the street. MS tourists visiting the Berlin Wall. TLS/MS East German guards at the Berlin Wall. CU Man taking a photograph. CU escape equipment used by East German defectors on display in shop window. Tourists taking a piece of rusty barbwire from the Berlin Wall as a souvenir. MS man looking at postcards on a rack. CU postcards. A new, slick prefabricated wall is replacing the old, barbed wire covered, Berlin Wall. Construction is in progress as the new wall will be higher, modern and impossible to climb. East Berlin's historical Reichstag Building. East German soldiers guarding the wall. East German soldier patrolling the wall with his Schutzhund trained German Shepherd dog. Soldier standing on the wall and an armored car driving very slowly patrolling the wall. High angle of the top of the barbed wire covered wall. A German Army transport truck being loaded or unloaded by soldiers through the fencing. CUS - Soldier removing barbed wire from the wall with a sledge hammer. Medium CUS - Soldiers legs and his Shepherd laying down by his feet. CUS - East German Soldiers taking down part of the wall brick by brick. A prefabricated wall is set down with the help of two soldiers and a crane. Medium LS - The Reichstag building. 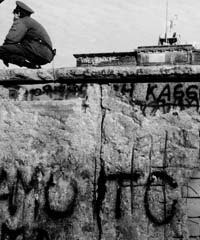 The Holiday season begins for West Berliners on the day the Wall of Shame is opened for visits to relatives in East Berlin. They line up before dawn at five checkpoints, anxious to take advantage of every hour that passage to Communist Berlin will be open. It is estimated that more than a million visitors will cross over in a two-week period. A crowd of people standing at a closed door, evening shot. The door open's and people start filing through. As the crowd moves the camera focus's on the faces of the East Germans. East German guards watch as people go through the halls of a building that will lead them to West Berlin and to their families. Motor check point the people patiently drive to the check point, stop and have their papers checked out by the guards. A vintage couple crossing the street with their suitcases in hand, waving to their family. It must be a brother because they greet and kiss. West Berliners crossing over to the East, their packages seem to be a little bigger than the people from the Eastern side of the border. Three older ladies (sisters?) embrace and kiss with tears filling up in their eyes. A woman and her husband greet their friend or sister as she gets to their side of the street. A man comes rushing up to his family member standing behind barriers, they greet each other with a brief hug and kiss. Families walking down the street, united once again even though its for a short time. Fog-shrouded Berlin is a bright place as the Wall of Shame is opened for visits from both the West and the East. Thousands wait at the barrier in West Berlin, the vanguard of 120,000 who visit in East Berlin in four days. Meanwhile, the East German Communists have allowed the elderly and the ill to visit in West Germany. Significantly, no able-bodied workers were allowed to visit in the Free World - The Reds can't afford to have them defect. Fog shrouded Berlin appearing extremely ominous. A crowd of people some with their children waiting for the gates to be open to West Germany. In the darkness of the early morning with fog hanging over the city the crowd moves towards the open gates. The crowd of East Germans walking in West Germany to visit family and friends. Throngs waiting on train station platform, train makes a stop. Adults hugging their parents, sisters with their arms around each other. Mother pushing a child in a stroller and another little girl by her side. Older married couple walking, husband needs the aide of a cane and the wife is carrying a suit case. Boarded up buildings. The Berlin Wall is sealed once more as the 17 day pass agreement ends. Westerners say their last goodbyes to East German relatives before returning to free Berlin. During the period nearly a million and a quarter passes were issued to West Berlin residents. Not surprisingly, there wasn't one who decided to defect to Communism. East and West Berlin, Germany Camera pans the Berlin Wall made of bricks and cement and in back of that bar wire. MCUS - A family reunited hugging on the other side of the Berlin Wall. MS - You see the top of the barb wire wall with throngs to get on the other side to see family members in East Berlin. MS - People walking through the opening of the wall from West to East Berlin. MCUS - Someone on the East side of the wall is replacing the barrier to keep the West Berliners out. MS - West Berliners walking next to the Berlin Wall, the father is holding the child in his arms as he walks with his wife. Tension Increases Tension along the Berlin Wall between East and West Berlin increases dangerously as East German soldiers reinforce the barricade through which more and more desperate people are escaping from the Soviet sector into Free West Berlin. Rack focus from barbed wire fence to guards on patrol. Sign reads HALT MINEN - with danger skull images. Mine fields. Soldiers look through binoculars. German officials and soldiers put barbed wire and fence posts into place at Berlin Wall. Halt Refugees The flight to freedom from East to West Berlin continues despite threats to close all traffic between the sections of the city. People getting off of trolley, man helps elderly woman. Shot of luggage and parcels people carry, going to boarder. Lines of refugees. Mothers with babies and buggies. People carry suitcases. Little boy with backpack, suitcase and bag. 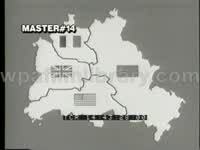 East Germany Closes Border Animated map of East and West Germany, zoom into Berlin. The attention of an anxious world is focused on East and West Germany and Berlin. The last great exodus of refugees from the east is processed in the Marianfelde center as the communist German regime moves to close their border against further flights. Troops swooped down on the border between red Berlin and the free city in the pre-dawn hours to close routes between the sectors. Refugees waiting at borders. Little boy lays in stroller. Old woman holding small cup while little boy drinks. People seated on bench, waiting. Passengers boarding plane. Train pulls into station, passengers unload belongings, mother hugging baby. Soldiers closing borders, make blockades, gates, and unroll barbed wire. Soldiers patrol area. Military official pushes young man away. 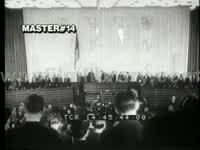 BORDER CRISIS - Allies Protest Pact Violation With the border in Berlin between East and West firmly sealed, the allies have swung to the belief that the communists pulled a propaganda blooper when they ended the free flow within the city. World opinion is heavily in favor of the West and the Russian propaganda machine seems content to let the onus rest on the East German regime and not on the soviets themselves. German military officials stand in jeep looking through binoculars across border. Soldiers. Truck spraying water? Crowd, sign reads, 'Kennedy noch Berlin'. Mayor Brandt speaking. Massive crowds. Allies Firm In Face of Red Threats Berlin continues to be front page news in every corner of the globe. Press, photographers. Chancellor Konrad Adenauer arrives in West Berlin for a visit that proves a great morale booster to the German people as the reds continue to pile charge upon charge against the west. The Chancellor makes a tour of the border and was the object of taunts from east sound trucks. Pan of wall. Now the reds have bricked up windows and doors of buildings that overlook the border. Guards on patrol of border. Soldier places elbow on railing, and hand on head, resting. U.S. troops arrive to cheering crowds. Berlin statue with bear. Sign: 'You are now entering the U.S. Sector of Berlin' U.S. troops wave to civilians. Berlin Report: Border Quiet, Allies Confer There's a period of watchful waiting in Berlin as the West Berliners await the next move of the allies. The East Germans open two offices in the west to issue travel permits and they are promptly closed by the allies who won't recognize the need of permits. Mayor Willy Brandt is joined by economics Minister Ludwig Erhard in a tour of the border area which is comparatively quiet. News reporter with large microphone and cord, by Brandt. WS border with wall and barbed wire. West Berlin - They Wait West Berliners, under the protection of allied troops, go about their daily tasks well aware that their divided city has been pounced upon by Khrushchev as his frail reason for resuming atom-bomb tests. Sidelights on life in Berlin show allied soldiers on streets, a British lad riding bike is escorted to school by tanks after threats from east Berlin police; a bride is married in the east while her mother watches from the west. Man smoking, fills in mortar, and other workers fill in cement blocks. Women look out windows below at soldiers guarding wall. Mother crying, little girl wiping away tears, and waving to daughter who was married on the other side. Former Vice-President Richard Nixon visits the East Berlin Wall with his family. The man who once opposed Mr. Kennedy for the Presidency expresses himself in complete accord with United States policy. 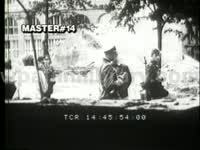 East Berlin, Germany Newsreel of Richard M. Nixon visiting the Berlin Wall with his family. EST- shots of the Wall, of Checkpoint Charlie. MS's - soldiers checking Nixon. MS's - Nixon acting as goodwill ambassador, surrounded by press. The Wall Of Shame in Berlin has been breached again - but by the East German Red regime for their own ends. The new opening in the Wall is designed to provide a shorter route to the East Berlin airport. The Reds hope to get tourists to use their airlines. West Berlin, Germany Wooden post sunken into the ground strung with barbed wire, elevated guard's tower. MS - About 6 rows of sunken post spaced about 5ft apart, strung with barbed wire, east and west guards looking at each other. MS - Guard standing with a German Shepard dog. MSOH - A workman working on a cement wall. MS - Sign 'Walersdorfer Chaussee. CUS - Military checking out pass ports and legal papers of the travelers driving their cars into East Germany. MS - Border patrol open the gate to let a car through. More than 200 memorial services recall that day in 1953 when Germans in Soviet sector attempted to revolt and were defeated by Soviet tanks and guns. Vice-Chancellor Erhard and Mayor Brandt lead 75,000 in a rally before the town hall as a Freedom Torch is lit. Berlin, West Germany Two East Germans guarding the Berlin Wall. CUS - Flowers and a cross marking the graves of the people who fought against the wall and lost with their life's. 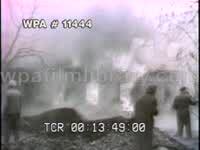 Camera pans - An burned out apartment building on East side of the Berlin Wall. MCUS - West German politicians carrying wreaths to lay by the graves. MCUS - Vice-Chancellor Ludwig Erhard and Mayor Willy Brandt. MOHS - Throngs of people at a rally for the tearing down of the Berlin Wall. MCUS - Torch barrios running with a torch symbolizing freedom for East Germany. The flame being lit. 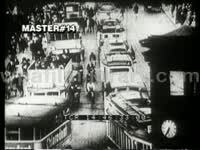 Same as catalog #428573 w/o audio Master 1885 - Tape 2 GV street in Berlin busy with pedestrians and vehicular traffic. MSs Dean Rusk, Secretary of State, leaving building with entourage. GVs crowds with banners to see Rusk. MS Rusk and entourage leaving in convertible car. GV car leaving, street is lined with waving spectators. MS crowd waving. GVs Rusk moving about Berlin. Low angle CU of sign reading 'Potsdamer Platz', pan down to MS section of the Berlin Wall. GV Rusk and entourage viewing the Berlin Wall. GV Berlin Wall, barricades and military truck. GV Rusk and entourage touring the Berlin Wall. June 12, 1987, Remarks on East-West Relations at the Brandenburg Gate in West Berlin, Germany. Ronald Reagan says that the free world (as in, the US) is thriving (in purely capitalist terms) and the Communist world is a failure. "Today I say as long as this gate is closed, as long as this scar of a wall is permitted to stand, it is not the German question alone that remains open, but the question of freedom for all mankind." "In the 1950s Khrushchev predicted, 'We will bury you.' But in the West today, we see a Free World that has achieved a level of prosperity and well being unprecedented in all human history. In the Communist world, we see failure. There is one sign the Soviets can make that would be unmistakable, that would advance dramatically the cause of freedom and peace, General Secretary Gorbachev, if you seek peace, if you seek prosperity for the Soviet Union and Eastern Europe, if you seek liberalization, come here to this gate. Mr. Gorbachev, open this gate." Cheers, union of German and American flags waving. "Mr. Gorbachev, tear down this wall." Cheers. August 15, 1988 Ronald Reagan Remarks at the Republican National Convention in New Orleans, Louisiana. "... I'm grateful to God for blessing me with a good life and a long one. But when I pack up my bags in Washington, don't expect me to be happy to hear all this talk about the twilight of my life. Twilight? Twilight? Not in America. Here, it's a sunrise every day -- fresh new opportunities, dreams to build. Twilight? That's not possible, because I confess there are times when I feel like I'm still little Dutch Reagan racing my brother down the hill to the swimming hole under the railroad bridge over the Rock River. You see, there's no sweeter day than each new one, because here in our country it means something wonderful can happen to you. And something wonderful happened to me. We lit a prairie fire a few years back. Those flames were fed by passionate ideas and convictions, and we were determined to make them run all -- burn, I should say, all across America. And what times we've had! Together we've fought for causes we love. But we can never let the fire go out or quit the fight, because the battle is never over. Our freedom must be defended over and over again -- and then again. There's still a lot of brush to clear out at the ranch, fences that need repair, and horses to ride. But I want you to know that if the fires ever dim, I'll leave my phone number and address behind just in case you need a foot soldier." Diss to montage: MS Ronald and NANCY REAGAN riding in limo, waving to crowd after 1981 Inauguration; TLS Congress standing and applauding, CU Reagan humbly smiling; MSs Reagan at meetings, tossing football, blowing out candles, riding horses with Nancy, walking and talking with GEORGE BUSH outside the White House, saluting WWII veterans at Normandy, shaking the hand of MIKHAIL GORBACHEV, welcoming (separately) MARGARET THATCHER and MOTHER TERESA (of Calcutta) to the White House; tTLS crowds standing atop the Berlin Wall after its fall; MSs Reagan saluting American military personnel; WLS delegates on convention floor. "Twilight, you say? Listen to H.G. Wells. H.G. Wells says: ``The past is but the beginning of a beginning, and all that is and has been is but the twilight of the dawn.'' Well, that's a new day - our sunlit new day - to keep alive the fire so that when we look back at the time of choosing, we can say that we did all that could be done - never less." MSs Reagan being sworn in, '81 & '85. 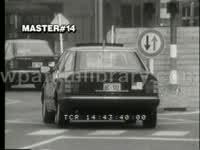 Sign reading: 'Allied Checkpoint Charlie", tilt down to show border crossing gate, late 1980s Ford sedans roll through. Pan as jeeps roll past the graffiti covered Berlin Wall, pan out to sign reading: 'You are leaving the American Sector'. Berlin Wall. Men build the wall, stacking the blocks as armed guards stand by. Berlin Wall escapes. Man looking out barbed wire window. People lowering a woman from window, she falls. Soldier, Conrad Schumann running through barbed wire to other side. 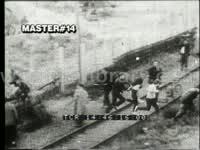 People charging barbed wire fence, one woman gets caught up but manages to break through. Wattenberg At Large - Irving Brown. Cold War tensions at East-West Berlin border, culminating in construction of the Berlin Wall 1961. East German refugees entering a train station. American soldiers at Checkpoint Charlie in Berlin peering into binoculars, standing on guard with long round bazooka, etc. Soviet armored truck in East Berlin. Soviet soldiers on guard. Masses of Refugees. East Berlin Communist soldiers building the Berlin Wall, digging in posts, unfurling barbed wire, laying cement. Civilians on one side of Berlin Street watching construction. Workers with cinderblocks and mortar and stringing barbed wire atop of Berlin Wall.